Books are Fun! Combining Children’s Books with Food Is the Best Way! Inside: Books are fun! Reading children’s books that teach lessons creates children who think! And, did you know that reading to your kids every day translates into early talkers, early readers and more? When adding food to the quotient, you are utilizing multiple senses for multiple learning experiences. Bottom line: combining books and food equals learning! Books are fun! 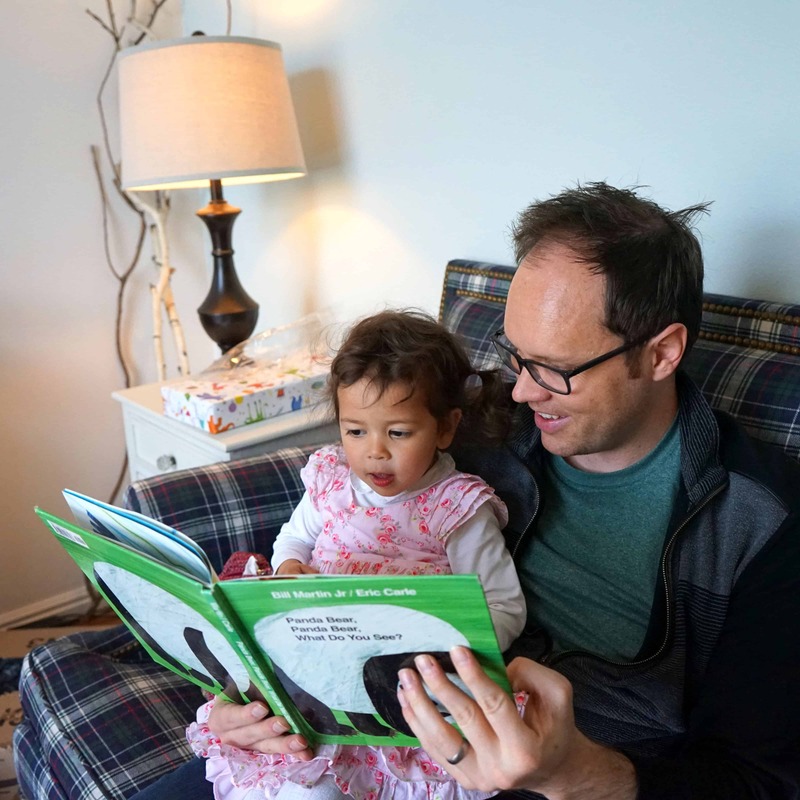 Did you know that reading to your kids every day will turn them into early talkers, early readers; children with larger vocabularies, better focusing and concentration skills, and better listening skills (to name just a few)? It’s true—if you want to raise brighter, smarter kids—you need to get them involved in three things: reading, music, and movement. I love reading to kids! And, children’s books are the best. They take you to faraway places; allow you to vicariously participate in exciting adventures, overcome impossible feats, and live to tell the tale. Plus, good children’s books always teach valuable lessons. And, you can have all this for a mere $15-$20 (book) price tag! Reading aloud was our sons favorite time of the day and they particularly loved books that included food. Why? Well, who doesn’t love the #1 American pastime…eating. So we combined reading and eating to create a memorable experience. Today, there is a HUGE emphasis on healthy eating for both adults and kids. With obesity on the rise and all the genetically modified foods packing on the pounds, we need to stop and evaluate what we’re consuming and how we can make healthy lifestyle changes. Since kids learn by example, it’s important that parents lead the way when making food choices. 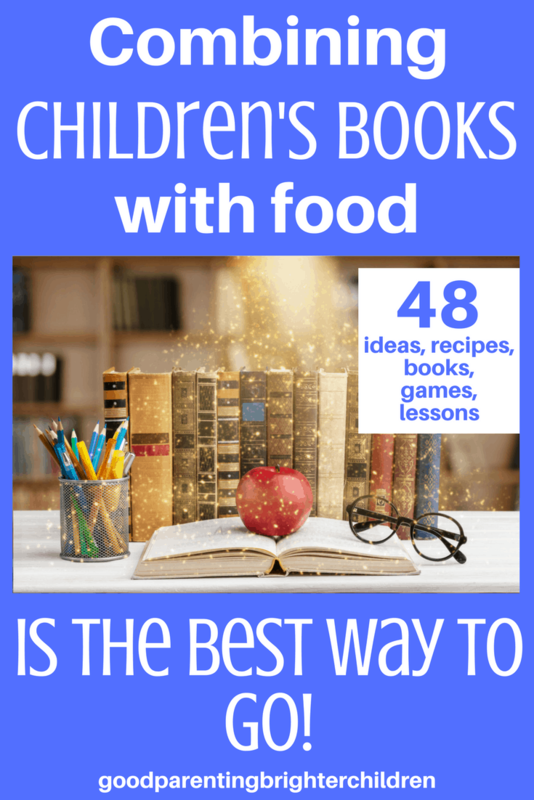 One way we motivated our kids to eat more fruits and veggies was to read books to them that talked about these foods and involving them in the cooking and baking. Here are a few of our favorite books with some fun cooking and baking ideas. Disclaimer…not all these food choices are perfectly healthy. However, I added some tips at the end for making foods healthier. I love stories! So, do kids! And the best way to make a story memorable is by cooking or baking along with the story. Find ways to add food to your reading! This is a classic story of three hungry soldiers who outwit the greedy inhabitants of a village into providing them with a feast. The core of this tale is about sharing and giving. Because it’s also about making soup—it’s the perfect opportunity for you to make a healthy, hearty soup with your children. Have them pick out their favorite vegetable(s). Read the book then make vegetable soup from the veggies you purchased. Plant a garden with your kids. Get input from all family members on what to plant. Include the following: tomatoes, green peppers, green beans, and carrots because they are perfect ingredients for vegetable soup. Make planting, weeding, watering and picking the veggies a family affair. Everyone helps! 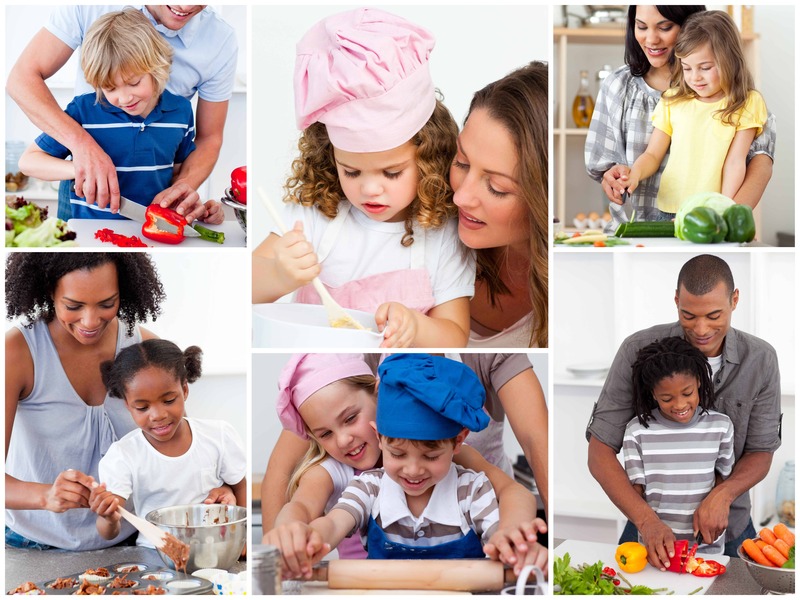 Studies show that kids who are involved in cooking (and planting) their food are more apt to try it and eat it. As mentioned above, the core message of this book is sharing. So, share! Double the recipe and share your homemade soup with a neighborhood family. Or, better yet, invite a family to your house to share the soup. And explain to them how you combine reading aloud with healthy eating. Four adventurous siblings—Peter, Susan, Edmund, and Lucy—step through a wardrobe door and into the land of Narnia, a land frozen in eternal winter and enslaved by the power of the White Witch. But when all hope is almost lost, the return of the Great Lion, Aslan, signals a great change . . . and a great sacrifice. If you have read this book, you will remember Edmund eating Turkish Delight given to him by the evil White Witch. After eating this magic food, Edmund loses all desire to help or be with his family. He can only think of his own selfish desires. Go to a candy store like Sees or Ethel M’s. Purchase ONE kind of chocolate that is uber sweet. Raspberry cream chocolates from Sees fits the bill. In the book, Turkish Delight was sickeningly sweet, so you want something that will cause your kids to feel a bit “woozy” from sugar overload. Explain to your children, you are going to pretend that these chocolates are “Turkish Delights.” As you are reading the part in the book, pass around the chocolates for everyone to eat. The idea is to eat all of them in one sitting like Edmund. Edmund ate so much of a “good” thing that he loses his good judgment. You can’t full on things you don’t need (too much sugar). All else obtained, the emptiness remains. Meaning, you can eat all these chocolates, but the problem with sugar is after gorging yourself, you still feel empty because sugar is nothing but empty calories. Sugar is 8x more addictive than cocaine. This book is an all-time classic picture book. Believe it or not, it is sold somewhere in the world every 30 seconds! It’s been said that “The very hungry caterpillar literally eats his way through the pages of the book—and right into your child’s heart… Yes, this book is for toddlers, but when you’re adding food, it works for older children, too. Let your children know that one of the reasons the caterpillar got sick was that he ate too much junk food such as the cake, ice cream cone, lollipop, cupcake, pizza, and cherry pie. In order to feel better, he had to go back to eating something simple like the leaf. Simple foods often do the best things for our bodies. The leaf would be like eating vegetables each day–they help us to feel better. Emphasize the importance of making good food choices that include plenty of fruits and vegetables. Here’s another book about making food choices: What’s Going On Inside the Fridge? by Mrs. D.
“Do you like green eggs and ham?” asks Sam-I-am in this Beginner Book by Dr. Seuss. In a house or with a mouse? In a boat or with a goat? On a train or in a tree? Sam keeps asking persistently. This book is a Dr. Seuss favorite. Children love the rhyme and they love Sam-I-am who insists that this unusual treat is a delectable snack and can be eaten anywhere. Dye some scrambled eggs green and have everyone try at least one bite. Explain to your kids that green-dyed eggs do not change the taste of the eggs, but we think the color changes the taste. Cook another new food for dinner, and like the character in the story—every person needs to try at least one bite. Parents remember: it’s difficult to get kids to eat something new. Seuss uses food that we don’t associate with being green to emphasize that when a child tries a new food it can be unnerving and even a bit scary. So, be patient! Experts tell us that in order for a child to embrace a new food, it needs to be introduced to them from eight to eleven times. Remember that when you’re trying to get your kids to eat certain healthy foods. If a hungry little mouse shows up on your doorstep, you might want to give him a cookie. And if you give him a cookie, he’ll ask for a glass of milk. Next, he’ll want to look in a mirror to make sure he doesn’t have a milk mustache, and then he’ll ask for a pair of scissors to give himself a trim…one thing leads to another in this “circular” charming tale. It is impossible to read this book without having a bag of chocolate chip cookies nearby to munch on. Create a fun and memorable experience and dump the store-bought cookies and make your own chocolate chip cookies. Your children will forever associate this book with warm, chocolaty memories! Click here for my recipe for The Best Chocolate Chip Cookies Ever. I have created two recipes–one for people at sea level and one for people at high elevation because yes, it makes a difference in the final cookie! The best time of the day is time spent with your kids–in this example, baking and reading! In life, one thing leads to another and oftentimes leads you back to where you started from. This author has also written other books associated with food: If You Give a Moose a Muffin, If You Give a Pig a Pancake, etc. They are great books to incorporate food. The following two books, I talked about in earlier blogs. 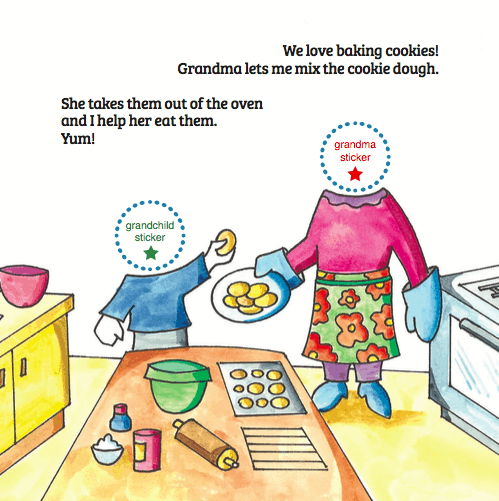 They are written by grandparents and both include cooking ideas you can do with your grandkids. First, Violet Favero wrote the book, Sunday Dinner at Silly Yaya’s. She includes a recipe for Greek Vinaigrette and talks about how she cooks Sunday dinner with her kids and grandkids. You can read all about the fun here. Rick and Angela Blesi are authors of A Fun Day with Grandma. One of the illustrations shows grandma making cookies with her grandkids. If you decide you want to make chocolate chip cookies with your grandchildren, click here for the recipe: best chocolate chip cookies ever. You can read more about their books here. I love reading books to my grandkids! These are amazing personalized books that add adventures you do with your grandkids…like baking cookies! Sugar: Use organic sugar. You can get organic sugar at Costco. It is not pure white and the grains are larger, but it easily mixes with the other ingredients. Flour: If your children have gluten issues, use Wheat Montana white flour. It’s organic and can be purchased at Walmart. Gluten issues are caused by genetically modified wheat which has 40x more gluten. Note: Even people with celiac disease love this flour! Reading aloud to your children is important and adding food to the quotient makes the experience 10x more memorable and fun! Stay tuned for Part 2 of this series–more fun reading and eating ahead! And remember–you can get my Chocolate Chip Cookie recipe here. Want to remember this post? Post, “Combining Children’s Books With Food is the Best Way to Go” to your favorite Pinterest Board! As an adult who was finally diagnosed with Celiac’s disease, I can tell you organic wheat cannot be safe for a true Celiac. Let Celiac Disease be diagnosed by a doctor. The only “cure” is to never eat gluten. This disease was around before GMO. My friend’s husband and 2 children both have “true” Celiac disease (they had the biopsy of their small intestines), and even though I do not have “true” Celiac, I have issues with wheat so unless it is sprouted wheat, I don’t eat it. However, this same friend told me about Wheat Montana (brand of flour) and said that it was the ONLY flour that she can use (other than making her own rice flour) where her husband and kids do not get any of the symptoms they get when eating regular flour made from a GMO wheat. That’s why I tried it and I was amazed–it worked for me, too. Have you read the book, “Grain Brain” by David Perlmutter, MD? Based on what he said, the GMO flours, which are the main flours in the market, all have 40x the amount of gluten than flour that is not a GMO. He also said that for many people, an organic flour will work. Based on what you said, an organic flour may not work, no matter what. However, you said you were “finally diagnosed”–so obviously you have had this issue a while. I’m wondering if your symptoms are such that your system has become very sensitive and for your best health, you need to completely stay away from wheat. Thanks for sharing! Always love different points of view! I would read Stone Soup to my elementary classes every year the day before Thanksgiving break. I loved it so much for many of the reasons you listed above. I mainly did it at that particular time of the year to foster the idea of giving and sharing within my classroom. Great post, Sharlene! You sound like a wonderful teacher! Lucky students! I remember the first time I read this to my oldest son–he was three years old and I was trying to get him to eat something healthy. So, we read the book and made the soup. Was it a success? Not quite…he picked things out of the soup that he wanted to eat…nothing more! Stone Soup was a family favorite! Thanks for sharing–as always–great comments!